For my Round Fire Pit. Having the correct amount of FireGlass glass will help make your fire pit design project successful. To aid in this we have provided a handy calculator to do the calculations for you. All you need to do is enter the diameter of the fire pit into the calculator and you are on your way. NOTE: Please be aware that FireGlass will not typically work correctly with the burner included in a propane fire pit purchased from your local retailer. Email us if you have questions about this. 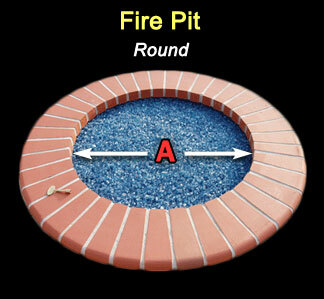 View the image to learn where to measure inside your fire pit. Then enter your measurement into the calculator and click the "Calculate" button to see how many pounds of glass you need. The calculater is set to give you the weight based on a "2 inch glass fill method". You can deduct other fill thicknesses by using simple math. If you want to give us the dimensions of your fire pit, we will gladly calculate this for you and give you a few options. Simply Contact Us with your questions.